The use of a radiometric calibration target enables the software to calibrate and correct the images' reflectance according to the values given by the calibration target. Note: In addition to the use of a calibration target, radiometric correction can be applied on the images in order to improve their radiometric quality. For more information: Radiometric corrections. What is a calibration target? Practically, the radiometric calibration target (also called calibrated reflectance panel) is a white balance card giving the reflectance properties of the card across the spectrum of light captured by the camera (i.e. Red, Green, Blue, NIR and/or Red Edge bands depending on the camera). The use of a radiometric calibration target enables the software to calibrate and correct the images' reflectance according to the values given by the calibration target. It thus takes into consideration the illumination conditions at the date, time and location of the image capture as well as some of the sensor's characteristics. The calibration target also enables to have an absolute reference, which allows to get absolute reflectance values and make it possible to compare data coming from several cameras or flights. 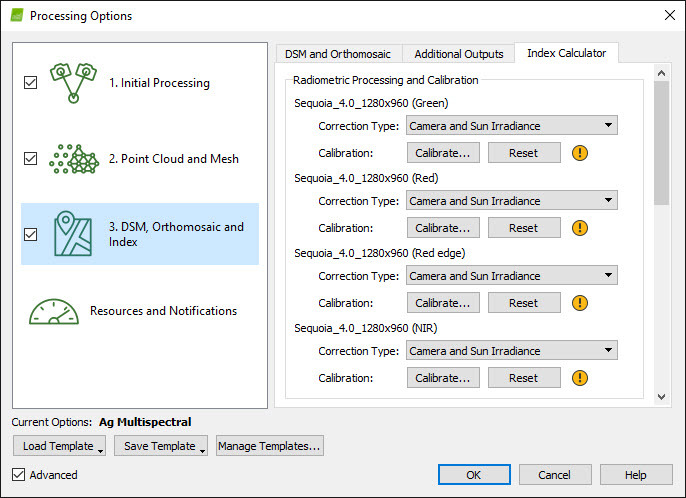 It is recommended to use a calibration target when generating reflectance and index maps. Which calibration targets are supported? Automatic importation: The pictures of the calibration target are automatically recognized by the software when importing the calibration images along with the other images during the project creation. For more information: Radiometric calibration target. Automatic marking: The calibration target region is automatically marked on calibration images and the reflectance values associated to each band are automatically entered. For more information: Radiometric calibration target. Manual marking: The calibration target region on calibration images should be manually marked and the reflectance values associated to each band should be manually entered. For more information: Radiometric calibration target. Note: The reflectance value entered manually will be saved in the software and automatically reused if another project is created in the future with the same camera and calibration target. Important: In any case, the manual importation is always available. During the manual importation, the calibration target images are imported separately to the other project images. For more information: Radiometric calibration target. How to take images of the calibration target? The target should be level with the ground, and not at an angle. The target should be aligned to the North, to avoid artifacts when sun angle correction is applied. The target should not be affected by the shadow or reflection of eventual surrounding objects that would false the image reflectance. The calibration region should not be over/under exposed in any of the bands. We recommend placing the target on top of a fairly reflective surface for the auto exposure not to overexpose (e.g. on light asphalt). If the images are taken from the ground the camera holder should stand around 1 meter away from the target and not be facing the sun. Ensure that the camera GPS writes correctly the time and location information for the processing of the calibration images. Take several captures of the calibration to ensure to get at least one valid calibration image. It helps in case of overexposure: Radiometric calibration target. Check the calibration target shots while on the field to assess the quality of the images and avoid under/overexposure. Should the radiometric calibration images be taken before or after flying? Before or after flying: It does not matter if it is taken before or after flying. It is important that the weather and lighting conditions are as similar as possible to the ones during the flight. During the flight: The target should be big enough to be properly visible for the UAV and cover many pixels on the capture. Should the radiometric calibration images be taken from the ground or while flying? The radiometric calibration target should cover enough pixels to get good statistics. If a target is big enough to be properly visible from the air, then the image can be taken from the air. If this is not the case, it is recommended to take the image from the ground. How to use calibration target images in Pix4D Desktop? 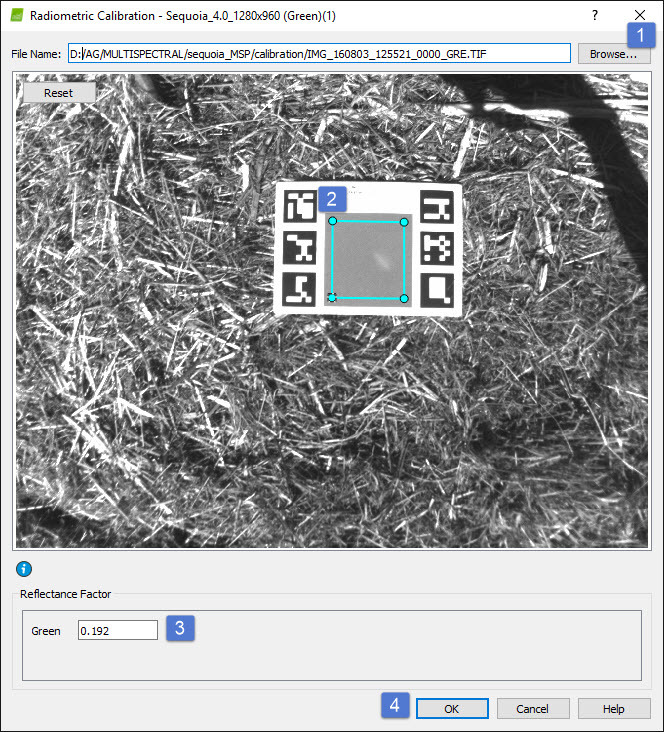 In possession of both radiometric calibration target and camera supporting automatic importation and marking (for more information: Radiometric calibration target), the pictures of the target are automatically recognized by the software and the target region and appropriate reflectance values are saved in the project. To calibrate the project, simply import the calibration target images along with the other images during the project creation: Step 2. Creating a Project. The reflectance values can still be reviewed in the processing options: Menu Process > Processing Options... > 3. DSM, Orthomosaic and Index > Index Calculator. 1. On the menu bar click Process > Processing Options..., the pop-up Processing Options appears. 2. Click 3. DSM, Orthomosaic and Index and select the tab Index Calculator. Click Browse... to import the corresponding image of the calibration target for the selected band. Draw a region on the image that will define the radiometric calibration area, the region should be well inside the gray target and exclude all borders. Insert the Reflectance Factor value for the selected band. The Reflectance Factor value should be furnished by the target manufacturer. Only values between 0 and 1 will be accepted. Click OK. The camera is now calibrated for this band. 4. Repeat the same procedure for each of the discrete band, click OK and run the project. Note that the radiometric calibration of the images is performed during Step 3. DSM, Orthomosaic and Index. Information: For more information on the radiometric processing and calibration option: Menu Process > Processing Options... > 3. DSM, Orthomosaic and Index > Index Calculator. In possession of both radiometric calibration target and camera supporting automatic importation and marking (for more information: Radiometric calibration target), import the calibration images along with the other project images. The pictures of the target are automatically recognized by Pix4D Cloud and the target region and appropriate reflectance values are automatically saved in the project. Note: As mentioned previously, automatic marking works for Airinov Aircalib calibration target with Sequoia camera or the new MicaSense calibrated reflectance panel with RedEdge or Sequoia cameras. 1. Create a project on Pix4D Desktop. For more information: Step 2. Creating a Project. 2. Import the calibration target images along with the other project images during the project creation ensuring that they are all be contained in the same folder. 3. If the target images are not automatically marked, mark them manually. For more information: Radiometric calibration target. 4. Upload the project to Pix4D Cloud. For more information: How to upload project files from desktop to cloud. Information: For more information on how to process an agricultural project on Pix4D Cloud:Processing agriculture projects on the cloud. What to do if the error message "Unable to compute radiometric target calibration" appears? The error message: [Error]: Unable to compute radiometric target calibration, appears because the area of the calibration target is overexposed in the calibration target image. In that case, none of the pixels in the target area can be used for radiometric calibration. To avoid such an issue in the future, see the recommendations on how to take images of the reflectance panel: Radiometric calibration target. If another calibration image has been taken during the same flight mission it can be used to replace the overexposed one. Note: It is not possible to take another calibration image from a different day since the calibration target anchor the captured data to the lighting conditions of the date, time, and location of the flight. It must be taken either immediately before or after the flight. Redo the flight and acquire new images of the calibration target. Process without using the calibration target images (and thus for all discrete bands). Note that without the use of calibration target images, the comparison with other flights will not be accurate.